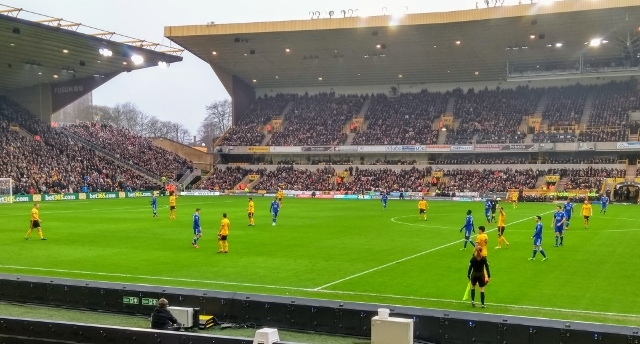 Leicester City slipped to a third successive defeat, as a strike by Diogo Jota deep into stoppage time gave hosts Wolves a 4-3 victory at Molineux. After abject humiliations by Newport and Southampton in the previous two games, there was little surprise when Claude Puel again rang the changes, giving Harvey Barnes his first Premier start as well as recalling Danny Simpson and Demarai Gray to the side. As too often this season, though, a poor start to the game left the Foxes facing an uphill task. 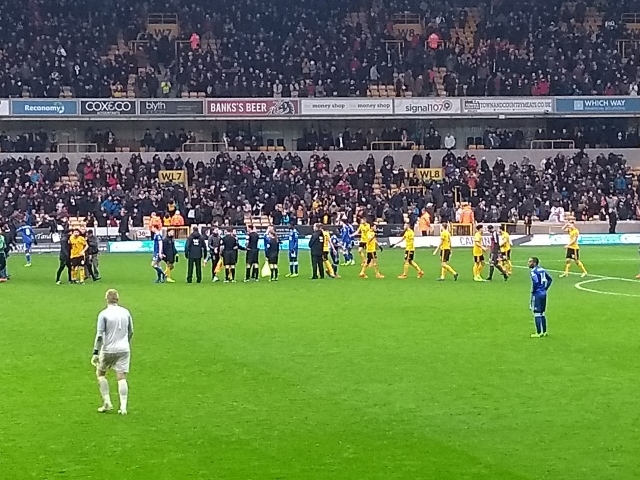 Wolves pressed strongly from the kick-off, with Neves forcing Kasper Schmeichel into a spectacular save within the first three minutes. But the home breakthrough was not long denied, with Jota netting from a Moutinho cross a minute later following a series of avoidable defensive errors. City mounted a frenzied response, with Jamie Vardy being denied by home keeper Rui Patricio and Harry Maguire heading over from close range. The hosts weathered the mini-storm, though, and extended their lead after 12 minutes with a goal that was contentious on two counts. First of all, Moutinho's corner, as TV footage confirmed, was some way outside the quadrant. Secondly, many referees would have called a foul on Bennett's overtly physical challenge on City defenders before heading home. However, referee Kavanagh – who has featured with remarkable frequency on City's travels this season – ruled nothing was amiss and allowed the goal to stand. To their credit, City continued to take the game to the home side in the wake of this setback, though clear-cut opportunities were few and far between. Meanwhile, Wolves continued to threaten on the break and only good work by Schmeichel prevented further additions to the scoreline. Many travelling supporters were bemused when Puel sent an unchanged side out after the break. Yet, within six minutes of the restart, his faith was vindicated as City managed to restore parity. Vardy, finding space for once, pounced on a loose ball to send Gray clear for a clinical, composed finish. Then Barnes blasted the equaliser, via a deflection from home defender Coady, after a long range effort from Ben Chilwell had been blocked. TV replays showed Barnes' shot appeared to be heading goalwards before the deflection, and the league should be as respectful to him as they would have been to, say, Harry Kane or Mo Salah in such circumstances. Although the goal was officially credited as Coady's, there is provision for an appeal, and it is to be hoped City will make use of it. In between the goals, City were forced into a defensive switch when Maguire limped off with what appeared to be a recurrence of the knee injury that sidelined him for a month before Christmas. 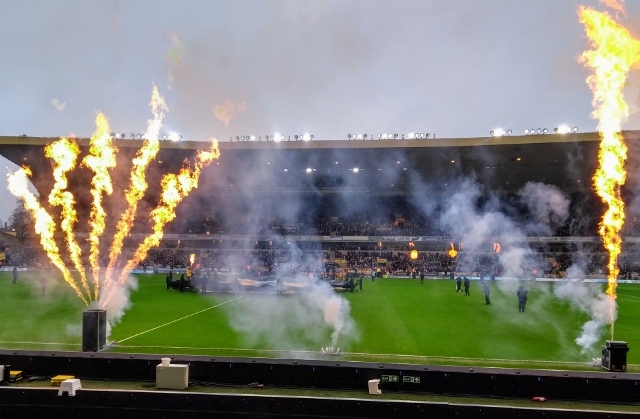 This change did little to ease the wobbles that had been evident in the visiting back line throughout the afternoon, and Wolves regained the lead when Jota outpaced Wes Morgan to fire past a somewhat indecisive Schmeichel. 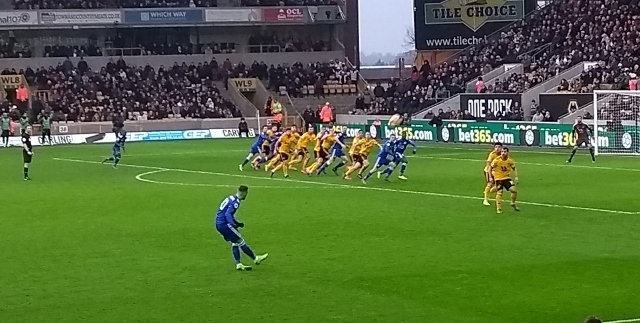 Once again, though, the Foxes were able to grab a lifeline, when James Maddison, on for the tiring Barnes, produced a superbly-weighted free-kick which found Morgan at the far post for the skipper to net his first league goal in two and a half years. City, perhaps unnerved by the raucous, frenzied atmosphere, pushed hard for a winner in the closing stages when a more considered approach may have served them better. 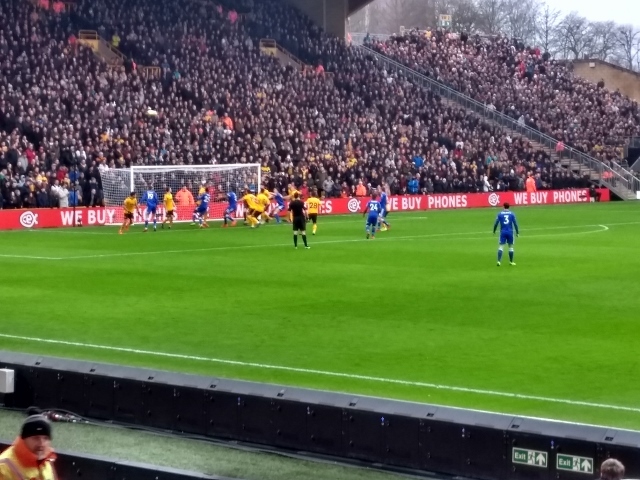 As the game entered stoppage time, Jota looked certain to complete a hat-trick when he burst through on goal, only to overrun the ball and allow Schmeichel to recover. But the Portuguese striker still had the final word – and the match ball to go with it – when Jimenez burst through a weak City offside trap and presented him with another chance to win the game. This time, he made no mistake. The scoreline was a replica of that from City's only previous Premier League trip to this venue in October 2003. While the circumstances were slightly less harrowing this time around, the Blue Army still found them difficult to digest. Results later in the day mean that despite City's current abysmal form, a 7th-place finish – and a potential Europa League place – still remains within reach. Whether Puel can inspire his charges to rouse themselves to mount a challenge for this prize, though, remains in serious doubt. It is more likely that, as last season, the campaign will be allowed to drift fitfully through the closing months, and that, once again, the potential within the squad will remain unfulfilled. Wolves (3-5-2): Rui Patricio; Bennett, Coady, Saiss; Otto, Dendoncker, Neves, Moutinho (Gibbs-White 81), Vinaigre (Doherty 73); Jimenez, Jota. Subs not used: Ruddy, Cavaleiro, Costa, Giles, Traore. City (4-2-3-1): Schmeichel; Simpson (Iheanacho 83), Morgan, Maguire (Evans 48), Chilwell; Ndidi, Mendy; Ricardo, Gray, Barnes (Maddison 73); Vardy. Subs not used: Ward, Fuchs, Choudhury, Albrighton.